please call 1-800-273-8255 Option 1, for text or chat click here. 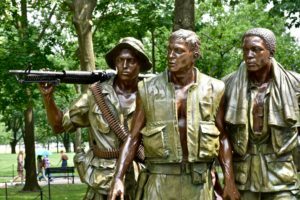 The mission of the Vietnam Veteran Project is to restore dignity to the brave men and women who served in Vietnam and have been forgotten. It is well known that many veterans in need have been underserved or ignored. This is especially true of Vietnam Veterans who courageously fought for their country in a very unpopular war and were generally despised when they returned. 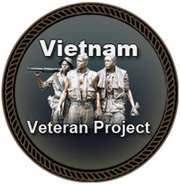 Our goal is to provide maximum utilization of our resources to help Vietnam veterans. Our services help provide housing, counseling, VA assistance and other services to Vietnam Veterans. Respect the veterans we deal with. We will not waste our resources on expensive trips, entertainment or anything wasteful. The 1st Cavalry Division (Airmobile), commonly referred to as the 1st Air Cavalry Division introduced the use of helicopters in 1965 as troop carriers, cargo lift ships, medevacs, and as aerial rocket artillery. This had never been done before in a war and allowed the quick movement of troops, saving wounded soldiers lives and putting sheer terror in the minds of the enemy. 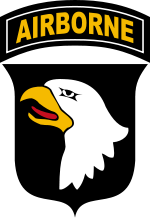 The 101st Airborne Division (“Screaming Eagles”) is an elite modular specialized light infantry division of the United States Army trained for air assault operations. It was one the most potent and the most tactically mobile of the U.S. Army’s divisions. The 101st Airborne at a moment’s notice was able to plan, coordinate, and execute brigade-size air assault operations capable of seizing key terrain in support of operational objectives. The 1st Infantry Division (Big Red One) is the oldest continuously serving Division in the Regular Army. It has seen continuous service since its organization in 1917 during World War I. The division fought in the Vietnam War from 1965 to 1970. Arriving in July 1965, the division began combat operations within two weeks. By the end of 1965 the division had participated in three major operations: Hump, Bushmaster 1 and Bushmaster II. During the Tet Offensive of 1968, the division secured the massive Tan Son Nhut Air Base. The Big Red One conducted reconnaissance-in-force and ambush operations, including multi-divisional operations. The 1st Marine Division is a Marine infantry division. In March 1966 the 1st Marine Division Headquarters was established at Chu Lai. During the 1968 Tet Offensive, the division was involved in fierce fighting with both Vietcong and North Vietnamese Army elements. The division received its 7th Presidential Unit Citation for service from 29 March 1966 to 15 September 1967 and an 8th one for the period 16 September 1967 to 31 October 1968. After six hard years of combat and after suffering 7,012 men killed in action, the 1st Marine Division returned home to Camp Pendleton in 1971. The 25th Infantry Division (nicknamed “Tropic Lightning”) was one of the first American divisions to serve in Vietnam, and one of the last to leave. In nearly seven years of combat the division fought in every major battle around the South Vietnamese capital of Saigon. Their mechanized and armored units proved invaluable in locating and destroying an elusive guerilla foe, and defeated every major North Vietnamese offensive. U.S. Military Assistance Command, Vietnam (MACV) was a joint-service command of the United States Department of Defense. MACV was created on 8 February 1962, in response to the increase in United States military assistance to South Vietnam. The 3rd Marine Division is an infantry division. On 6 May 1965, the 3rd Marine Division opened the Marine Compound at the Da Nang Air Base, Vietnam. The first major multi-regiment operation against the North Vietnamese Army (NVA) was Operation Hastings in July 1966. During the Vietnam War, the 3rd Marine Division suffered 6,869 men killed in action. The division departed South Vietnam in November 1969 with more than 20 Marines receiving the Medal of Honor. The 4th Infantry Division deployed from Fort Lewis to Camp Holloway, Pleiku, Vietnam on 25 September 1966 and served more than four years. Two brigades operated in the Central Highlands/II Corps Zone, but its 3rd Brigade, including the division’s armor battalion, was sent to Tay Ninh Province northwest of Saigon to take part in Operation Attleboro (Sep-November 1966), and later Operation Junction City (February to May 1967), both in War Zone C. After nearly a year of combat, the 3rd Brigade’s battalions officially became part of the 25th Infantry Division in exchange for the battalions of the 25th’s 3rd Brigade, then in Quang Ngai Province as part of the division-sized Task Force Oregon. The 11th Armored Cavalry Regiment (“Blackhorse Regiment”) The Blackhorse Regiment deployed to Vietnam on 11 March 1966. The regiment began specialized training for combat in a counterinsurgency environment. Modifications were made to the organization and equipment with emphasis on the use of modified APC’s (Armored Personnel Carriers). Two M-60 machineguns with protective gun shields were mounted at the port and starboard rear of the vehicle, and a combination circular & flat frontal gun shield(s) were added around the .50 caliber machine gun located at the commander’s hatch. The 20th Engineer Brigade is a combat engineer brigade deployed to Vietnam in August 1967. The brigade numbered over 13,000 officers and enlisted men organized into three engineer groups, with 14 battalions and 31 separate companies and detachments. The brigade provided all non-divisional engineer support in Military Regions III and IV during eleven campaigns. Units cleared more than one-half million acres (2,000 km²) of jungle, paved 500 kilometers of highway, and constructed bridges totaling more than six miles (10 km) in length. The brigade was inactivated 20 September 1971.